Six words! In today’s world, they sound like something from the movie, “Ghost Busters”, or from a séance. They don’t sound real in today’s hectic, fast moving pace. But make no mistake, they are very real. 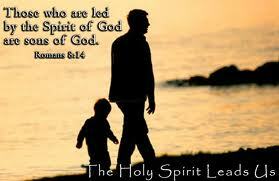 The Holy Spirit is not only present in this world but is active in it, as well. In all honesty, I feel very insecure in trying to write something about the Holy Spirit. Nevertheless, I will try to write what my feelings, my beliefs are. There is so much to try to get our arms around, when we speak of one of the three Persons in God. Our belief immediately is called into play. How do we, finite persons, think we can adequately describe or attempt to explain the inexplicable? And yet, we try. Maybe it is pride on our part. Maybe it stems from our desire to understand, to behold, and to further adore. My belief is this, we must first try to, in some way, try to explain what the Trinity means to ourselves. For some reason, those of us who believe in God, find it easier (or at least less difficult) to associate all of Creation to God the Father. Maybe this is so, because we think of Him as being the older one of the group. But, we believe, we know there is only one God, but three Persons. We can only shake our head in wonder. But the belief that we have been given is a grace. We don’t believe because we know, because we understand, because it seems very logical to us. No, we believe, because it is God’s gift to us. So, we associate creation to the Father Almighty. Likewise, we attach salvation and redemption to the Son. All the while, we know that the two, together with the Holy Spirit, are the Triune God. As we said earlier, this is not something that can be easily said nor comprehended. What then is the task of the Holy Spirit? Keep in mind we are talking about the One God who created us, who loves us, and want us to be joined with Him forever in Heaven. God came to us, in the person of Jesus Christ, to save us, to show us what was necessary for salvation, to show us the importance of love for God, to show us the extent of the love of God. And so, we see Jesus saying to His disciples, “But I tell you the truth: it is expedient for you that I go: for if I go not, the Paraclete will not come to you: but if I go, I will send him to you -3”. We begin to discern that Jesus saved us, redeemed us, and showed us how we must live. He died and rose for us. And now, when He ascends into Heaven, then and only then, will He send the Spirit. What work was left undone? What else is required? -1 Each is distinct from the other two Persons, but of one Divine essence or substance. « …and is Seated at the Right Hand of God, the Father Almighty. He will come again to judge the living and the dead. 135,408 have viewed this site.